There is a lot of snow and more falling by the moment. Lately, it has been that very heavy, wet snow which covers every single branch and makes a truly beautiful winter wonderland. The dogs are camouflaging themselves as snowballs. 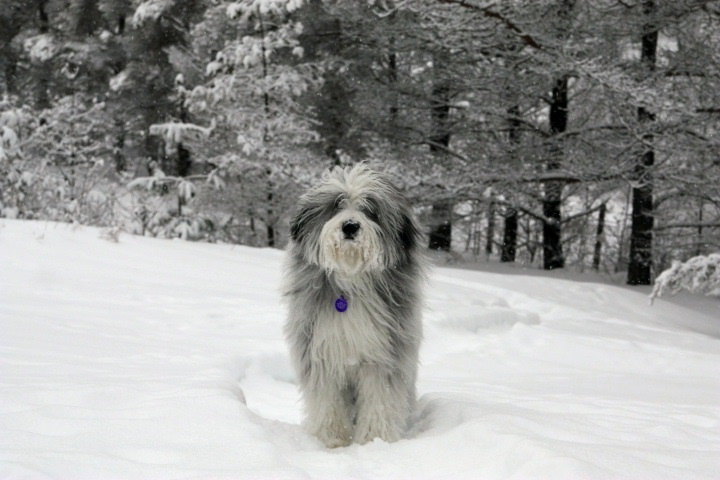 The temperature for the last few days has been the perfect snowball/snowman temperature – which means that every dog with hair (i.e. all 12 that are currently here) is accumulating snow with every step. After about 5 minutes, they can barely walk they are so heavily weighted with snowballs. The smaller dogs can easily fit in the sink, so they can each be thawed with the spray attachment in about two minutes, toweled off, and put by the woodstove to dry. But Annie, oh Annie… Annie has the longest hair and is the snowball queen. Not only that, but she loves being in the snow and does not want to come back inside ever. She spends her time making glorious snow angels and tunneling her face into the snow. 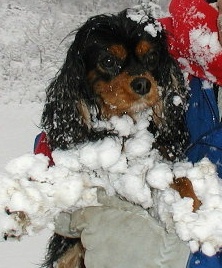 I hate to spoil her fun, but… When I eventually insist that she come inside, she needs major thawing out. If I left her to thaw naturally, it would take hours and hours and the floors would be drenched with the constant dripping. Because she doesn’t fit in the sink, we’ve come up with some alternative measures. 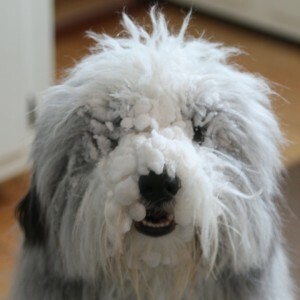 One afternoon, I tried using a blow dryer to thaw her out – essentially one snowball at a time. That worked ok, but it was pretty labor intensive. She was very patient – with a coat like hers, she has had a lot of grooming experience – but it took a ridiculously long time. Then I tried putting her in my only bathtub, which is upstairs. Picture it: giant bathtub, tiny bathroom. As anticipated, the thawing took much less time, but then I had a soaking wet dog upstairs. Today, the temperature is supposed to drop from the current 30 degrees into the single digits by tonight. Hopefully, that will end the snowball issue. Haha – they’re heartier beasts than me! What happy looking dogs! These photos are terrific! Love the colors in that last photo. It’s like she’s part of the trees.